No, he’s not a police officer. When people ask what Faith is about it can be a little hard to answer. Because technically I suppose it’s a time travel romantic historical fantasy medical drama. Let’s break that down. There’s time travel–the premise of the show is that a present day plastic surgeon is dragged back in time to an early period of Goryeo (Korea) history. But that’s not just the premise. They do time travel right. There’s evidence that she’s been back in time before, even earlier. There’s talk about sunspots (which everyone knows is the right way to do time travel.) They play on the fact that she knows the future. There’s magic. What’s better than time travel? Time travel with a warrior from the past coming to the present and shooting lightning at a wall of policemen. There’s a guy with a magic flute, there are ninjas who can run super fast, there’s a creepy girl who’s basically a scarier version of Azula. There’s a lot of surgery. Do you like watching people get cut open on screen? You’ll love this show. There’s not much blood and gore, except when the aforementioned surgeon has to stitch people up. Then we get to see it. It’s both gross and strangely riveting. There’s romance. Romance is a central theme to the plot. There are two couples who’s relationship troubles we follow. Their struggles are crucial to the plot, rather than being tacked on like so many “romances” but there is no doubt that without the love stories, the show wouldn’t be half as good. There’s history. Faith is primarily a historical drama. It covers a period of Goryeo (Korea) history around 1350 and features many notable historical figures from Korean history. It’s fascinating to look up the characters and compare the historical versions to the ones you see on screen. Look at that beautiful garden house. I want to go there. Do you want to go there? You know how everyone complains about the yellow/teal cinematography of today’s television? Are you tired of watching fight scenes take place in the dark between two characters wearing black, and cut together so fast you can’t figure out what’s going on? There’s nothing like that in Faith. It’s cinematography like you’ve never seen it before. We can argue about the merits of color schemes until the cows come home but at the end of the day, Faith is drop-dead gorgeous to look at, even if you don’t have a clue what’s going on. The costumes are colourful and intricate. The hairstyles are amazing. The sets are beautiful. The lighting is beautiful. There are several shots of Korean country-side that make you feel like you’ve actually paid the country a visit. 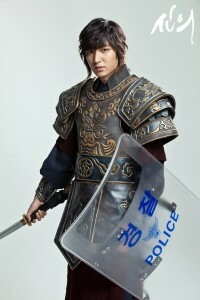 If you’ve not sure whether to try k-drama but you have a deep abiding love for costumes–try it. One of my pet peeves in modern American TV is the portrayal of romance. It’s not true love until you’ve slept together. It’s impossible to portray affection by doing anything besides kissing passionately. There are more bedrooms scenes then most average TV watchers are really comfortable with, and then there are stupid lovers quarrels that just add to the shallowness of the relationship. Guess how many kisses there are in The Great Doctor? One. In all 24 episodes the two main characters kiss once. Most of the intense romantic moments consist of two people staring intently into each other’s eyes. And you know what? It’s so much more real. We realize that so much more can be said in a gaze than in words, or intimacy. And they show their love in other ways too, real ways. Through sacrifice, and generosity and forgiveness. Meet King Gongmin, a Goryeo king raised in Yuan, who loves his country a little too much. 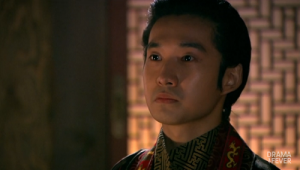 He wants nothing more than to restore Goryeo to it’s rightful place, but he is young and inexperienced and doesn’t know how to be a good king. Meet the Queen, a princess of Yuan who is secretly in love with her husband, but was rejected by him early in their relationship and now doesn’t know how to make amends. She desperately wants to help, but her Yuan heritage makes her the enemy, and she doesn’t understand how to make the right decisions. I could go on, but this post is long enough. You get my drift. Watch it. “What is this show about?” asks somebody who hasn’t seen it and comes in on episode four, curious why you’re watching something in another language.